The DPX is widely considered an excellent performer. Short barreled rifles (SBR) and AR-15 style pistols are seeing a spike in popularity in spite of some recent confusion over the legality of arm braces. Presumably a lot of these guns are being purchased or built with self defense or duty use in mind. AR-15 pistols and SBR’s can have barrels as short as seven inches in length, but the most common are between nine and thirteen. There are some real advantages to these configurations for law enforcement. Shorty AR’s come out of the car quicker, are easier to maneuver in close quarters and are much lighter than their full-size brethren. Of course, there are downsides to everything. One factor that makes the .223/5.56 cartridge effective in spite of its small diameter and light weight is velocity. That advantage naturally diminishes as barrel length decreases. It is widely accepted that at least one particular 5.56 mm military round becomes substantially less effective with an impact velocity of less than 2700 feet per second. It reportedly needs that velocity to fragment and create reliable wounding for incapacitation. The Internet has made certain that the 2700 FPS rule applies to all ammunition in the hearts and minds of many AR aficionados, although that may not be exactly true. I suppose the same can be said for barrier penetration. The .223 already has a mediocre reputation against vehicles. As the .223/5.56mm’s velocity decreases via an abbreviated barrel, barrier penetration also suffers. That’s a big factor in law enforcement shootings. So, how does a decrease in barrel length affect barrier penetration? We wanted to find out for ourselves. Typical barrier penetration tests involve the obligatory four layers of denim, wall board, plywood and steel. I’ve never seen a felon wearing more than one layer of denim and what in the world is made of a single sheet of plywood? I suppose people smarter than yours truly put these criteria together and probably for good reason. That said, those with some experience in law enforcement have undoubtedly seen actual crime scenes with bullet holes in wallboard and car doors. We chose those barriers for our pseudoscientific test. Wallboard is easy, but I was concerned about using car doors for testing because of the inconsistency of the internals. Those things have gears, bars, glass and all kinds of other inconsistent obstructions inside them. I consulted Dr. Martin Topper who does this kind of thing regularly for a large federal law enforcement training agency and expressed my concerns. He told me not to discount the vehicle door because they are realistic to law enforcement and to just be certain the test was as consistent as possible. I also consulted Peter Pi, the founder and owner of Corbon for this article. He is also not new to terminal ballistics experiments. In fact, this guy is responsible for the consumption of more gelatin than tonsillectomies. Peter realized very early on that there were benefits to all copper bullets for defense against violent felons. 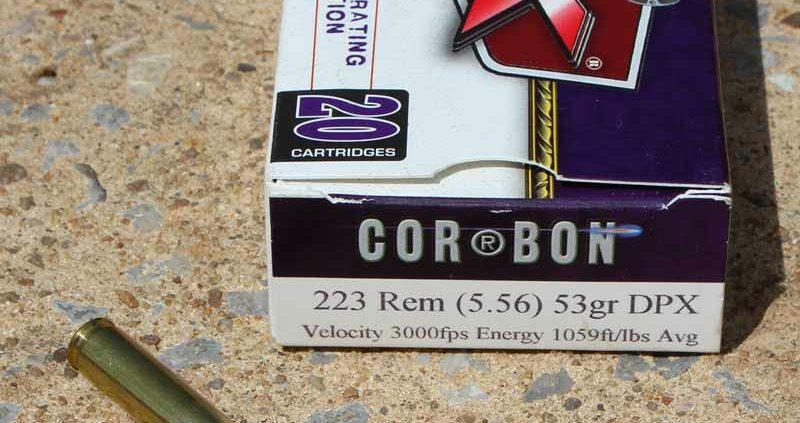 Corbon is so dedicated to the concept, in fact, that they stopped outsourcing the production of their projectiles and started manufacturing their own. I mentioned to Peter that I was considering some barrier testing with short barreled AR-15s. He highly recommended DPX. 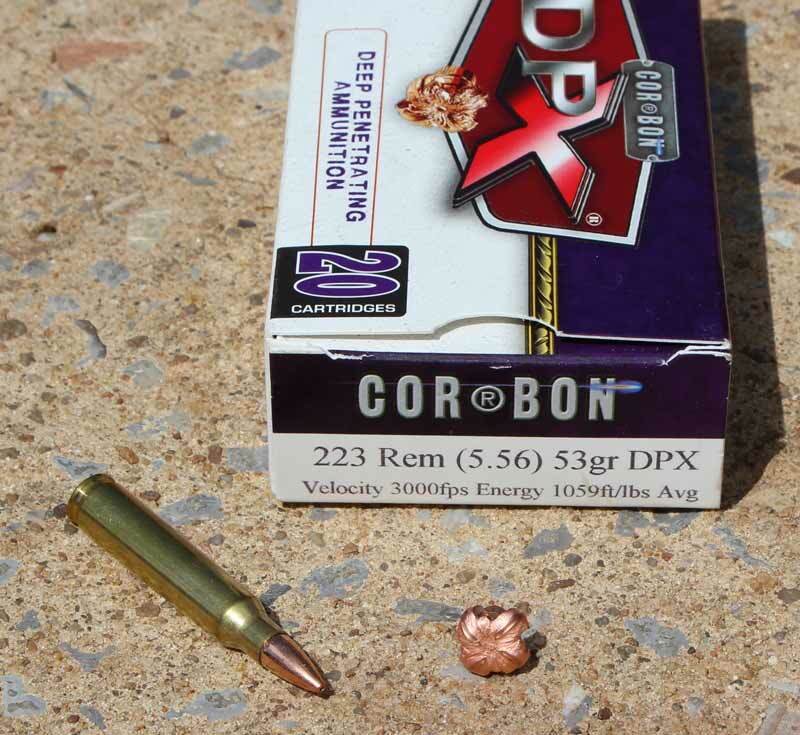 Corbon offers .223 DPX in both 53 grain and 62 grain weights. We used the lighter 53 grain DPX for testing. The .223 Corbon DPX expanded well and consistently through barriers. We used The Bullet Test Tube media to measure penetration and expansion. While ballistic gelatin purists might disagree with this choice, TBTT is good quality, cost-effective and easy to use. Moreover, it has similar penetration qualities to ballistic gelatin which is all that is required for this experiment. Each tube is just about 12″ long. I acquired a couple of vehicle doors from a local salvage yard and built two mock interior walls out of wallboard and 2×4’s. As is always the case, Corbon ammunition velocity is as advertised. The box says 3000 feet per second. That might seem a little low for a 53 grain .223, but DPX doesn’t need as much velocity to perform well, as will be evidenced below. A side benefit to the shooter is lower recoil and muzzle blast. The five-shot average with a 16″ barrel was a little over 3000 feet per second and about 2700 feet per second out of an 11.5″ barreled pistol. I managed to put three shots in under an inch at 50 yards from the seated position on my first attempt with that gun. We first shot the media through the wallboard with both the 11.5″ and 14.5″ barrel lengths. In both cases, the DPX penetrated the door and the tube leaving a fist sized hole in the ground behind it. I dug down several inches to try to find the bullet to no avail. Next, we shot the media through the vehicle door with both barrel lengths being certain to hit it in the same general area for consistency. In both cases, the DPX penetrated the door and the media tube before creating a fist sized hole in the ground behind it. I was starting to see a pattern. Granted, modern vehicle doors aren’t good cover, but they can significantly affect the travel and velocity of small bullets. The .223 is not supposed to do well against vehicles, right? I was determined to capture a bullet to measure and photograph. I put two tubes together behind one of my hastily-crafted miniature walls and fired a round from the 11.5″ barrel. After 30 minutes of digging, I located the perfectly expanded DPX bullet at a little over 18″ into the media. It’s recovered diameter was .487″ x .462″ and weighed 52.6 grains. (For inanimate objects, expanded DPX bullets sure do look angry.) Being on a bit of a roll at that point, I decided to try the car door again. I placed two tubes behind the door and fired a round from the 11.5″ barrel. The DPX penetrated the door, both tubes and made a fist-sized hole in the ground behind it. “Okay, DPX. You win,” I thought. The finishing “test” was to shoot a box of DPX through all different areas of the door to see if there was any area of the door that could even slow the bullet down. After the barrage, there were 20 fist-sized holes in the ground behind the door. 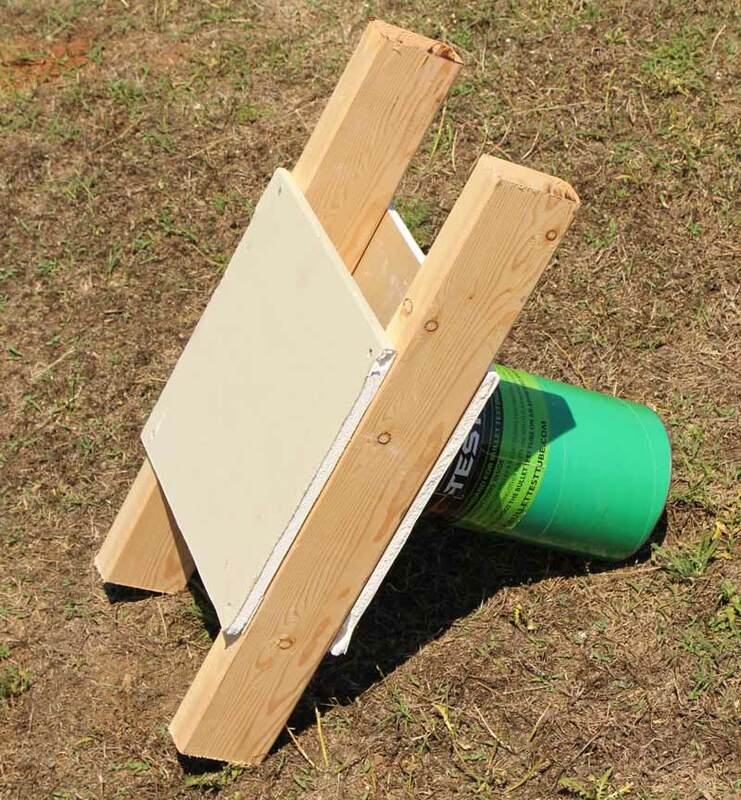 There was not a single ricochet; just a mock prairie dog town at my department’s range. Instead of fruitlessly digging for projectiles, I chose to just sheepishly fill in the divots like an embarrassed novice golfer. A mock wall built by the author made of wallboard and typical 2×4’s. We considered shooting DPX through a windshield, but that’s almost pointless. Not to go down a rabbit hole, there are few occasions when standing in front of a vehicle and firing at an occupant through the windshield is wise. On those rare occasions when that may be an officer’s last option, heavier bullets from other platforms are much more advisable. 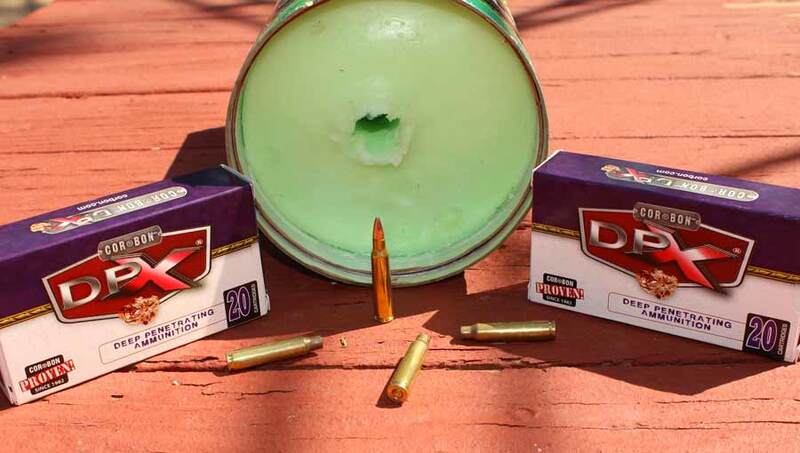 None of these results should be a complete surprise as the heavier 62 grain .223 DPX has performed similarly in many other tests with more traditional rifle barrel sizes. Still, one would think the lighter bullet combined with the short barrel might have caused some difficulty. That does not appear to be the case here. DPX in all of its calibers and weights is designed to penetrate barriers and still expand with some reliability. The DPX in .223 is a very different round. It works well in bare gelatin and with all of the normal barriers including steel. There just isn’t anything else in the caliber which can provide these results. I will be stocking up very soon.